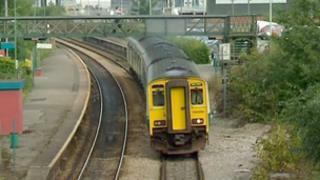 Campaigners hope to increase pressure on the UK government to extend a £1bn rail electrification scheme to Swansea. Electrification between Cardiff and London was agreed last year. But a group of south-west Wales politicians are urging businesses, councils and academics to work with them to push for an extension to Swansea. The Department for Transport said it was considering the business case for electrification in south Wales. There was disappointment for Swansea in March last year when the UK government announced electrification would only go as far as Cardiff. The transport secretary said at the time there was not a viable business case for electrification as far as Swansea. Organisers of a meeting in Swansea later on Friday say they hope to provide a "united front" to improve rail links to south-west Wales. Those attending include MPs and AMs, Virgin Media, Virgin Atlantic, Admiral, Amazon, Swansea University, business groups and Royal Mail. Supporters of electrification hope it will lead to faster, more frequent services. Swansea West MP Geraint Davies, who is leading the campaign, said: "There is a continuous urban footprint from Llanelli through Swansea to Neath Port Talbot and includes more than 400,000 people. "Taken together with west Wales and Bridgend [it] gives a population of over 935,000 by 2020. "A modernised, more extensive and frequent rail service will boost growth and inward investment." He said electrification to Swansea would help the south Wales economy to compete for inward investment with expanding high-speed rail lines in England. Views expressed will feed into a meeting of MPs in Parliament and provide "momentum" for a meeting Mr Davies has organised with UK Transport Minister Theresa Villiers next Tuesday. A spokesman for Virgin Media, which has a call centre in Swansea - which employs over 700 people - and several smaller sites in the city, said: "As an employer with significant presence in the region and several offices in both Swansea and Cardiff, Virgin Media welcomes this initiative to improve the rail links between the two cities. "Faster transport links will make it easier for staff to travel to and from work, and could also increase the range that job seekers in the region may be willing to travel to seek work." David Stevens, Admiral's chief operating officer, has previously said Wales needs "game-changing" trains investment to promote growth. The insurance group is one of Wales' most successful companies with major offices in Cardiff, Swansea and Newport. The Department for Transport spokesman said: "Electrification brings the greatest benefit when it is implemented on busy rail lines where older diesel trains need replacing. "That is why the [UK] government continues to work closely with the Welsh government to consider the business case for electrification of rail lines in south Wales and, subject to value for money and an agreement on financing, we expect to announce a decision in the summer." There have also been calls for a metro-style rail system covering 10 council areas in south-east Wales. UK Transport Secretary Justine Greening has said there is a "good case" for looking at electrification of the valleys lines. Welsh Transport Minister Carl Sargeant has said full electrification of both the valleys and Great Western line down to Swansea is "essential".